Well written, thought provoking, a very sad and tragic story. Still, today, I know of so many gay people who have gotten married, heterosexually, like the two characters in Brokeback Mountain, even though it isn't, what could be called, their true "bliss path." The term "living life as a lie" is so common. Spouses and kids suffer as well in these "marriages that shouldn't be." It's sad all the way around. One can't blame the Brokeback characters for not really knowing what they wanted, after all it was Wyoming in 1963, before Stonewall, even. Their gay relationship was troubled also as they suffered a lot of internal ambivalence over it, not to mention the threat of getting one's head bashed in with a crowbar for not toeing society's line. A friend of mine wondered why they didn't just "drive their trucks out to California," San Francisco for instance, to better lives. Back in 1963, it is easy to believe that they wouldn't know anything about gay life anywhere else on the planet. Also, once marriage and kids are involved, there are commitments that are hard to walk away from. The film followed their unhappy existences for 20 years, basically up to 1983 when more open gay role models could be found, but there was no hint of this in the film. The two main characters led insular lives seeming to have no knowledge of a larger gay world, or the news outside their own little worlds. They were focused on making a living, families, relationships and so forth; like a lot of people I know. Good thing it was just fiction as this was such a sad tale, but many real people do seem to live these kind of "shadow lives." Living in the closet can be hard. Following one's true "bliss path" is better, but it isn't always easy to know what that is, or to live it given society's pressures. * The natural scenery was fantastic, but living that stifling life of small town America? - Harsh. Just passing through can be better. 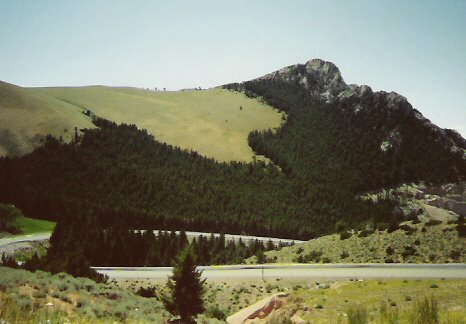 Above photo: Wyoming's Big Horn Mountains, from my 1991 bicycle tour across USA. I agree with you, Brokeback Mtn was a very sad film, but maybe because I'm not gay I had a different perspective. But this failure to relate carried over to all of Ennis' relationships, including the biggest/most significant of his life with Jack. I thought Ennis had a real ambivalence about himself, which led to him always settling for underachievement, not just in his personal life (marriage to someone he didn't really cherish) but also to his various "hired hand" jobs. However, I thought Jack had no such ambivalence. He knew what he wanted or needed, and made sure he got it, eventually paying the price for his unbridled passions. Magnificent scenery, though; Alberta, next to the Rockies, is way more beautiful than Wyoming. As for the movie itself, I thought it was pretty much overrated. Perhaps it's my ignorance of gay issues, but I can't help thinking that this movie is seen by the gay community as a watershed to mainstream acceptance. (Feminists influenced the larger society by appropriating the lexical high ground - ex: "feminist" is a positive term describing someone who works to improve the lot of women. There is no equivalent term for someone trying to improve the lot of men. Gays, on the other hand, have influenced society by assuming influential positions largely within the media, such as the Academy of Motion Picture Arts & Sciences, and their hype around such a mainstream gay movie was bound to arise.) Artistically, Brokeback sacrifices plot for some very obvious & simplistic character development, ending up with very little to hang onto. The film has a singular absence of compelling metaphors. Anyway, this is just my opinion and I really appreciate & welcome contrasting viewpoints; I just might learn something!